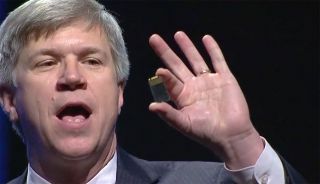 Rob Crooke took the stage at Intel's IDF Shenzhen conference to discuss upcoming storage technologies, and he had some exciting things to say. While 3D XPoint and Optane SSDs are interesting, we're not expecting them to be priced affordably—at least not initially. 3D NAND is a different matter. Crooke started with a discussion of Intel's 3D NAND, which is similar to Samsung's V-NAND. By using a mature process technology and stacking NAND die, 3D NAND is able to improve endurance and increase capacity in a much smaller form factor. Intel also mentions cost as a driving factor, which is always good to hear. Intel's first 3D NAND has 32 layers with four billion "pillars" of stacked NAND, which equates to 128Gbit of raw capacity. Using TLC NAND (three bits per cell), that yields 384Gbit/48GB per die. By next year, Intel says they will be able to store over 1TB of information in a chip that's only 1.5mm thick, presumably by increasing the number of layers as well as the density of the NAND (i.e., number of "pillars"). 1TB of capacity in a super small SSD? Yes, please! While it wasn't stated what sort of package we were looking at, it looks to be an M.2 2240, which is half the size of the typical M.2 2280 we usually see in laptops. But what if you don't care about a tiny form factor? Intel will be able to store up to 15TB of data in a 2.5-inch drive. For the server world, that means an almost ludicrous 1PB (i.e., 1000TB) in a 1U rack.